I've collected here some pictures of plates from provinces that didn't last long and disappeared before the second world war, as you can check in the full table of codes. At the present time I've found the pictures of plates from Pola (PL), from Perugia (PU, 1927-1933), from Apuania (AU, 1939-1949), from Zara (ZA, 1927-1945) and a couple (front and rear) from Fiume issued after 1930 (FM), but there are other provinces that, for different reasons, changed the origin code or disappeared: Castrogiovanni (CG, 1927-1928), Cuneo (CU, 1927-1928), Fiume (FU, 1927-1930) and Girgenti (GI, 1927-1928). Marco Viganò made a very good research about the plates from Apuania with the letters AU, reading directly the registers of the mtor vehicle administration of that province. 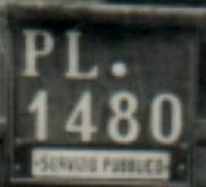 In 1927 the new license plates with the code of the province (MS) were introduced and all the vehicles changed the old plate with the new one, but keeping the same number, and due to the lack of the previous registers, it's hard to say which number the new plates really started from (around 300). 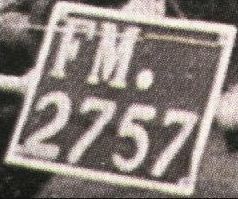 The last plate with the letters MS was issued on January the 26th 1939 and it's the number MS 2711, while the first plate with the letters AU was issued on January the 31st 1939 with the number AU 2712: the old vehicles didn't change their plates and the numbering kept on serially without any gap, but only with the different origin code. The same thing happened again when the code MS was replaced in place of AU: on January the 14th 1949 the number AU 4643 was issued and on January the 15th 1949 the number MS 4644. 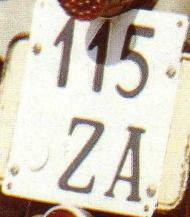 So, there were 1931 vehicles that had a plate with the letters AU of Apuania. In this web site you can find one more picture of a plate from Apuania: it's a small tag used for a bicycle. If you are interested in a short history of the license plates used in Fiume, you can read it in the old photo gallery (picture number 27). Last, there is something strange about the PU plates of Perugia that Adolfo Arena told me: the plates PU 1 and PU 2 were never issued, but the first plate was directly PU 3, even if it is not clear the reason for this. If you are interested in the full picture I took the detail of the PU plate from, you can find it in the old photo gallery (picture number 31). If you have any pictures with one of the plates still missing in this page, please write me via email and I'll be very glad to add your photograph. I must thank Carmine Delle Donne (CdsPartners) very much for the first picture, Adolfo Arena for the second image and Davide del Giudice for the picture number 7. The pictures number 3 and 4 are taken from the issue of October 2001 of the magazine "La Manovella".